Continuity mistake: When Brown pours water on Shane to wake him up, the wet patch on his clothes changes appearance between shots. Revealing mistake: After Mitchie wakes up at the start, her hand slides across the keyboard keys in the close-up, but that hand is not Demi Lovato's. The older looking hand has protruding veins and the fingernails are long, whereas Mitchie's nails are short and her hands look as young as she does. Continuity mistake: At Beach Jam, there is an orange marker on stage near Shane's mic stand, just above the letter 'c' in the word 'beach', which disappears and reappears during Connect 3's performance. 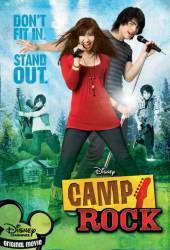 Continuity mistake: In the beginning, Mitchie's mom closes the Camp Rock brochure twice. Revealing mistake: When Peggy is on stage performing, she is only using one hand to play her guitar (to strum) but she doesn't use her other hand to change the notes yet we still hear the notes changing. . . Visible crew/equipment: When Mitchie is at her locker at school, Sierra walks up to her and there is a white marker line on the floor that she promptly steps on to speak to her friend. Continuity mistake: At the Beach Jam, Shane surprises everyone with his bandmates, and when the guys perform on stage Shane's mic/stand jump around during the song. Visible crew/equipment: A camera is reflected in Shane's guitar. This is when he sings "Gotta find you" to Mitchie Torres, when the guitar is facing the camera, you can see it reflecting in its surface. Continuity mistake: When Mitchie and Mrs. Torres are sitting at the table watching the TV show about Shane's shenanigans, and then discuss the camp, the remote changes positions on the table/napkin between shots. Continuity mistake: When Kaitlyn throws food at Tess the noodles are not on her arm, but in the next shot they are. Continuity mistake: When Shane walks into the camp's kitchen, the flour on Mitchie's face/hair changes between shots. Continuity mistake: At the pajama jam Peggy is wearing a head band which is long over by her shoulder but in the next shot the long part of her head band is gone. Other mistake: During Connect 3's performance at Beach Jam, Nate's guitar is missing its fourth string tuning key, which suddenly reappears as soon as he leaves the stage. 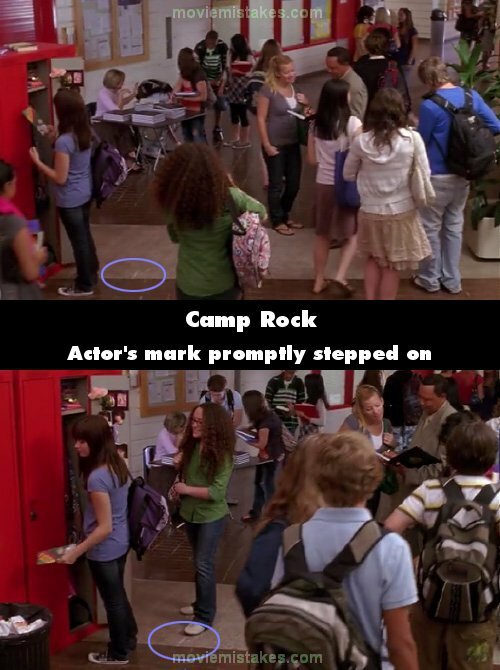 Continuity mistake: After Mitchie bumps into sleeping "rock princess" Ella she heads to the camp kitchen, and when she's done she opens the door (located beside the fire extinguisher) to the busy dining hall. When she changes her mind, in the close-up from the dining hall, the door closes behind her, but in the next shot from the kitchen that door is wide open - note the poster, which is on the wall in the dining hall. Continuity mistake: When Lola Scott is singing "What It Takes" in the opening mic jam, you can see two sets of posters hanging on the wall. But in the next shot, the second set of posters isn't there.